This is especially useful if you feel like your opponent is in the ascendancy, or equally if you feel like you’ve lost concentration, etc. In any of these situations, slowing the game down can come in handy. You may have seen other players wiping their hands down on the table after each point; although they are wiping the sweat off their hands, they are also taking some time to regain focus and think about what to do next. Other ways of slowing the game down include using the towel break – though this is only allowed every six points – or at a crucial part of the game, perhaps even a timeout. Alternatively, you can just take a few seconds before giving the ball back to your opponent, or before you serve yourself. So, what to do when you’ve slowed the game down? First of all, you’ll want to be mentally prepared for the next point. That means clearing your head of any previous mistakes/decisions against you/ things you would have/should have/could have done and focusing only on the next point. Deep breathing works for some people, and another technique is to tense all your muscles, before relaxing them. Another way to calm yourself and focus is to have some sort of pre-point routine. This can be absolutely anything and is different for every player. 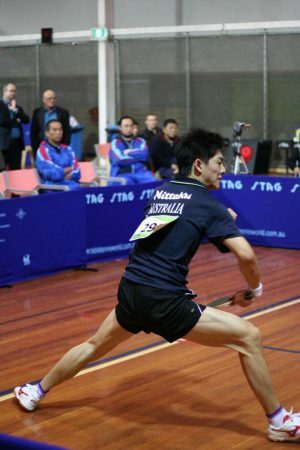 Some examples are Zhang Jike’s, where he bounces the ball on his bat a number of times before serving; or Rafael Nadal in tennis where he moves into his ready position in a particular way each time. A much simpler way is just some positive self-talk, perhaps you have a certain word or phrase etc that can help to motivate yourself. Don’t think about the score, the previous points or what you’re having for dinner tonight. The only thing on your mind should be the next point – and even then, you should be planning only 2-3 shots into the rally. If you’re serving, think about the spin and placement, and what you’re going to with the third ball. Similarly, when returning you should think about what kind of return you are trying for. Obviously, you have more control when you’re serving. When deciding what you’re going to do, think about how you’ve won previous points and your general strategy for the game.